Google Fiber, for all intents and purposes, was a failure. For all the promise of Gigabit speeds nationwide, Google managed just to install its super fast internet in just 20 cities while burning through billions of dollars and numerous staffers — including two CEOs in just nine months. But even in failure, few things are black and white. Google may have failed as an ISP, but we’ve all won — including Google. From day one, journalists speculated Fiber was less about competing with established ISPs like Comcast and AT&T, and instead rubbing their nose in failure. Failure is an accurate portrayal of internet service providers before Google got involved. They’d failed to upgrade critical infrastructure, speeds were lagging behind other developed nations, and large swatches of the country lacked access to anything resembling broadband speeds. Google, a company that still derives most of its revenue from online ad sales, saw an opportunity to do what it does best: innovate. This innovation had the added benefit of increasing profit. Faster internet speeds, as you might imagine, means more ads viewed per hour surfing. In 2010, Google announced Fiber — calling it an “experiment” — was coming to Kansas City, Missouri starting in 2012. Digging holes and burying cable takes time. By 2015, AT&T, Time Warner, and others were petitioning city leaders to bring their own fiber offerings to the city. AT&T even wanted to match Google’s blisteringly-fast Gigabit service offering. The story is the same around the country. 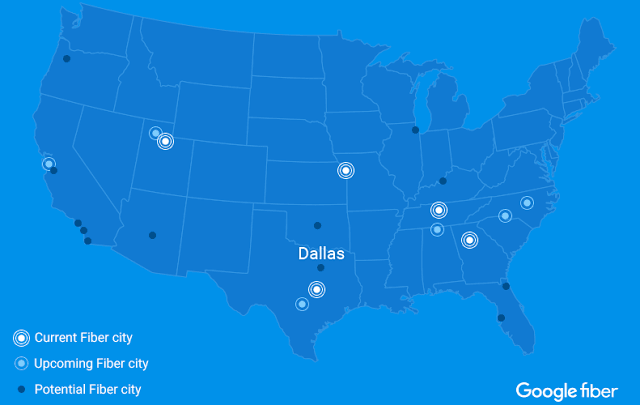 Raleigh, North Carolina — another Google Fiber city — now has AT&T and Frontier offering similar service — same in Austin, Charlotte, and Atlanta. Options are a luxury for consumers in this space. ISPs operated for over a decade without a clear competitor even offering the same level of service to specific communities. But when Google came to town, so did its rivals. AT&T, Comcast, Time Warner, Charter, and others, all started vying to get a piece of the pie they once owned outright. Once forced to compete, the price wars began. Comcast, for example, got caught red-handed offering Gigabit packages costing double what it does in cities with Google Fiber. What costs $70 a month in Atlanta and Nashville — two Fiber cities — ran $140 in Chicago — a “place of interest” for Google, but one without its Fiber offering. Google, even in losing, might be the biggest winner of them all. It’s hard to believe the search giant ever wanted to be an ISP, but by providing a threat to the major players in this industry the company ultimately got what it was after all along. And we got faster speeds, better prices, and the choice to switch between ISPs at will.